This may be concerning. Mine had similar symptoms and it developed valve timing issues, due to wear & tear on the left block. Unfortunately the proper check requires taking the engine out, which is expensive. Yours misfires on all cylinders, so spark plugs are less likely. I am having an intermittent misfire issue with my 996. It started a few months ago, when the battery ran down after not driving it for a few weeks, and I had to jump the car to get it going. After a few miles, I got a CEL and the car started to misfire. Upon arriving at my location, which was just a short distance away, I turned off the engine and went about my business. Upon returning to the car, it ran fine. No CEL and did 65mph all the way home, which was about 20 miles away. These are on both banks. After a couple of days, I went out, cleared the codes, and the car ran just fine. No CEL and smooth running. I drove it a couple of times, without incident. The only thing I can think of is that it must either be related to a low voltage battery messing with the computer or somehow related to moisture, since both incidences occurred around having just completed a rain storm. The car was not driven in the rain. This would possibly point to bad coils. I have checked the MAF, but disconnecting the plug, when it was misfiring. No change in idle. Seems strange to have multiple Coils fail at once? But possible. Same with spark plugs. One item of note. This is a replacement engine, replaced by Porsche, due to an engine failure while the PO owned it. The current engine has about 30K miles on it. I am not sure if all the maintenance parts were replaced, such as AOS, coils, plugs, and so on. Any thoughts on what to check to help narrow down the issue, other than just replacing everything or taking it to the repair shop? 2007 997 was running rough. 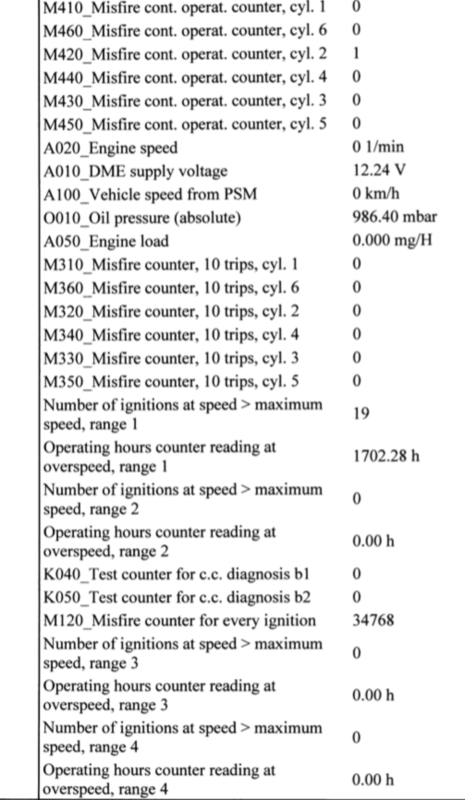 The Durametric said misfire cylinder one. Checked the forums and saw most likely culprit was either bad spark plug, bad ignition coil, or both. Oreilly’s had the Bosch spark plug and a coul that was labeled Import Direct. For the sake of convenience I bought the plug and coil from them. The coil was actually the newer version Beru ( oem) with the longer bolts. Much easier job than I ever imagined. There are good tutorials on YouTube. Engine runs great and I cleared the codes. No check engine light and codes haven’t returned. So, I've owned my 2003 996 carrera for the past 2 years and for the most part its been trouble free. I got it with 110,000 miles its now got 130,000. Maybe 5-6 times over the last year it's started misfiring as I come to a stop, it starts up after maybe 2 minutes and misfires for 30-40seconds, then runs fine. The last two times this has happened the display has said low oil pressure as it's been misfiring, but then starts running normally with no message? Any how just before Christmas I started the car as normal and left it ticking over but got held up,so it was probably idling for 40mins. I heard a loud misfiring sound and it cut out. I thought it had run out of fuel so I put a gallon in and it went up to a quarter. I tried starting it but it turns over but won't start. I have since had it towed in to a garage and they have plugged the computer into it and no faults are showing. Can anyone help as the garage isn't to sure?